The perfect farmer’s market accessory. When my nephew was born, my brother struggled to find a diaper bag that wasn’t feminine or decorated with baby-themed goop. He finally settled for a backpack. When I started traveling with Henri, my standard purse was too small, and I, too, had difficulty finding something that was functional but didn’t scream ‘Mommy!’ I lucked into having a girlfriend with a Coach addiction and a daughter who no longer required the use of a diaper bag. The function and fashion combo was great, but I needed something more. I started by brainstorming my social connections trying to figure out who I knew that would be interested in partnering to create Travel Tails DoggieBags. I wanted something I could design specifically for pet parents on the go- lightweight, water-resistant, sturdy compartments, zippered pockets, places for wet things, and a built-in poop bag dispenser. Part purse, part business (it needed to fit my ipad and/or client files), part dog bag. Multi-tasking was key. The HomeAway Travel Organizer Kit from Solvit Pet Products does ALL of that! With the company slogan ‘No pet left behind’, Solvit products are designed for mobility. I really like the Deluxe Car Safety Harness first featured in our trip to Hot Springs, Arkansas, but I wasn’t sure the bag would function to meet all of my needs. However, it sounded perfect for those of you who only travel with your pet on occasion or just don’t carry as much crap as we do. So I agreed to a review. My complimentary bag arrived on a Thursday, just in time for our busy weekend. The ‘kit’ includes a main organizer bag, a crystal polycarbonate BPA-free water bottle, two 8-cup collapsible travel bowls, and a dry bag for food storage. You can also order extra bowls if you need them. But first things first…I had to clean out my ‘purse’ and fit all our stuff into the new travel organizer. The interior of the main organizer bag includes two sewn-in fabric panels with velcro on one side to make three compartments. Undoing the velcro allows you to reconfigure it to whatever suits your needs, but I liked the three. My wallet and make-up bag went into the middle, the filled water bottle on one side, and a few of Henri’s things- refreshing spray, chamios, and treats- on the other side. Next, I made use of the two zippered pockets on the exterior of the bag. I put a roll of poop bags into the front left pocket and fed it through the brass grommet. In the right pocket, I stuffed two koozies (I never go anywhere without a koozie in my purse), a flattened roll of duct tape, a mini flashlight, and a sharpie. No wonder my purse is so heavy! In addition to the zippered pockets, the bag also features two mesh side pockets designed to store the travel bowls, and a large mesh pocket on the back. We didn’t need the food bowl, so I put the water bowl in one side pocket, and my keys, reading glasses, phone, and lipstick in the other. The large mesh pocket held a variety of things over the weekend and provided the versatility we needed when activities changed. Baseball in the rain? No problem. 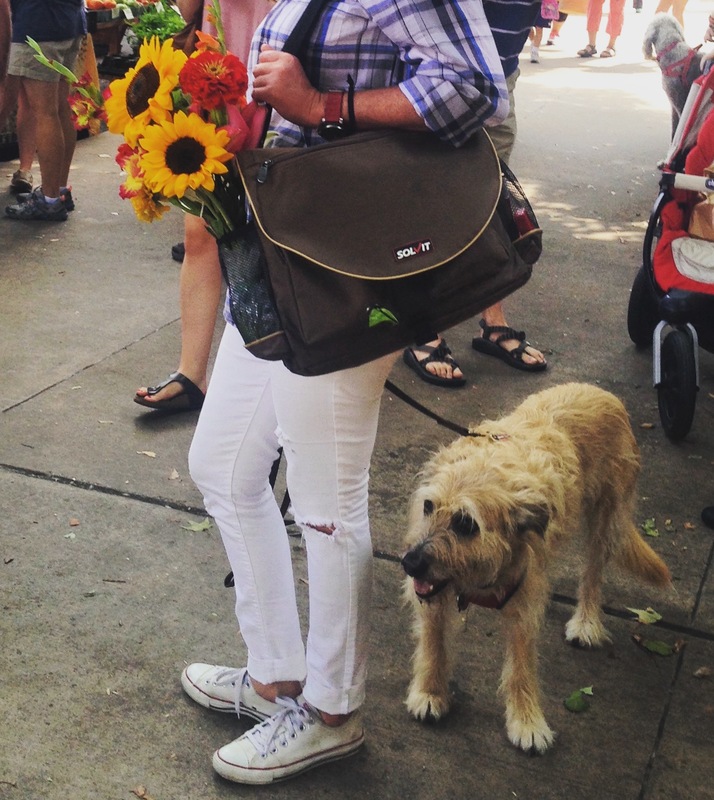 Our first outing with our new bag was to the Fayetteville Farmer’s Market on Saturday morning. For this trip, the large mesh pocket served as the holding place for a reusable shopping bag. When I bought flowers, I discovered the mesh side pockets were perfect holders for my bouquet. I moved the water bowl to the back pocket with the shopping bag, then stuffed my flowers in its place. The ventilated pockets are designed for damp things. For our next adventure, we were off to the lake. The travel organizer is made of water-resistant nylon, so it’s perfect for dock life. The shopping bag got replaced with Henri’s gel cooling pad, cooling bandana, and LED glow collar. The cooling pad made things a little heavier, but it all fit. 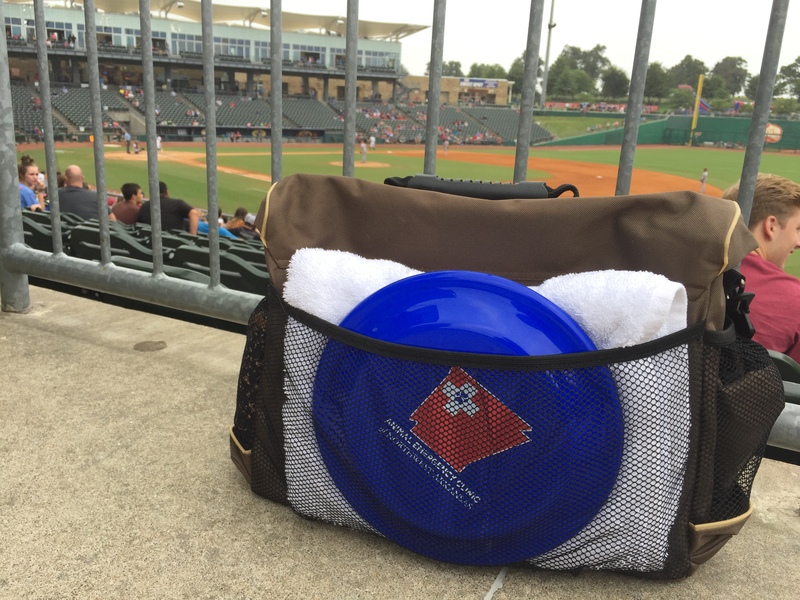 On Sunday, Bark in the Ballpark presented a different need. With it misting rain, we needed a full-size towel for wet seats and wet dogs. Again, the large back pocket was perfect for this. There was even enough room for our new frisbee. My only complaint? Color options! I’d love to have this bag in red with tan trim or ecru with navy. Lightweight with a unisex, messenger bag style, the HomeAway Travel Organizer Kit is the perfect accessory for pet parents- Moms OR Dads. With dimensions measuring 16 x 12 x 7 and weighing only 2.5 lbs., it can take you from the office on Take Your Dog to Work Day to the boat or the beach when your workday is done. It also comes with a limited lifetime warranty that guarantees it free from defects in materials or workmanship for the life of the product. For more information on Solvit Pet Products and how they can help make time spent with your dog easier, visit their website. You can also stop me on the street if you see me and ask to check out my bag. We’re keeping it!